Readability - Wylie Communications, Inc. But can they read it? Because readable messages reach readers, communicate better and boost the bottom line. How long is too long? Readers don’t want more information. They want the right information. Skipping! If your paragraph looks too long, people will skip it. So how long is too long? Make numbers count: Find the right numbers, get the numbers right and stop making readers’ eyes glaze over. How long is too long? Short sentences been proven in the lab to be one of the top 2 indicators of reading ease. Words first: Word length is the top predictor of readability. The shorter your words, the easier your message is to read. Can you read me now? 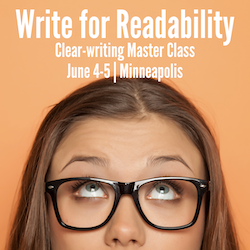 Measurably increase readability scores. Conduct a sound check: Run the “Hey, did you hear?” test. Cut it out: Get more tips and tools for making every piece you write easier to read and understand. Get more tips on readability on Rev Up Readership.